Established: By Legislative Decree No. 15 of 20 July 1964 and amended by ??? of ??? 1976 (?). 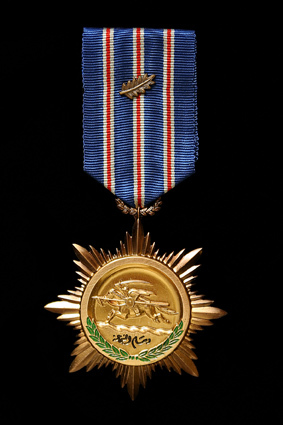 Awarded to members of the armed forces for courage and valor during military operations. It may also be awarded for more generalized courage of exceptional service in the public interest. In 1976 (?) award of the medal was extended to civilians and foreigners. The order is awarded by class, according to rank, as is detailed below. Also seen referred to as the "Valor Medal". 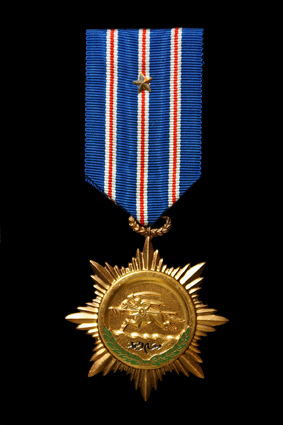 Obverse: Gilt, an eight-pointed rayed star with a circular central medallion showing a horseman charging toward the left. 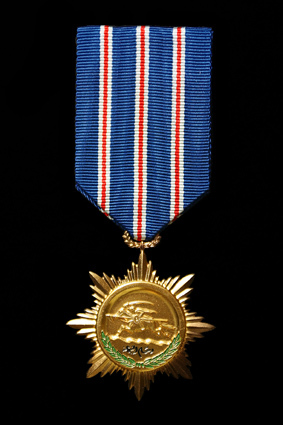 Below this, the legend "Order of Bravery". Around the bottom of this central medallion is a green-enameled semi-circular wreath. The size of the badge differs by class, as detailed below. The medal is suspended from a ring executied with a wreath motif. Reverse: Blank. Ribbon: Dark blue, three 1.5 mm red stripes edged with 1.5 mm white stripes. Subsequent awards of each class are indicated by a bronze oak leaf worn on the ribbon.